Jasper is one of the many gemstone varieties of quartz. It is an opaque and impure variety of silicon dioxide. The color is a typical multicolored, striped, spotted or flamed appearance. Jasper can form in virtually any color. 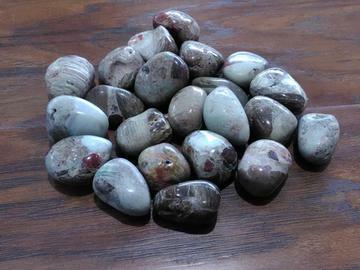 Mosaic Jasper is a stone of grounding, protection, and warding off negativity. It is used for digestive system, liver, gallbladder, and circulatory.